There’s stuffed spaghetti squash and then there’s chicken alfredo stuffed spaghetti squash. Doesn’t the latter sound much more appetizing? It is! Not only does this baked spaghetti squash recipe taste phenomenal, but it’s filled with a fantastic combination of healthy and yummy ingredients that taste even better together. Make this the next time you have guests over for dinner and they’ll be impressed with the overall deliciousness AND the beautiful presentation. Share the recipe with friends and family on Facebook, Pinterest, Instagram, and Twitter. To make 6 servings, begin by preheating your oven to 400° F. Cut spaghetti squash in half and scoop out the seeds with a spoon. Drizzle olive oil over the spaghetti squash flesh and rub it in with your hands. Place prepared spaghetti squash flesh side down on a baking sheet and bake for 40 minutes, or until the squash is tender and flakes easily with a fork. Remove spaghetti squash from the oven and flip it over on the baking sheet so the flesh side is facing up. Evenly distribute the cooked chicken and chopped broccoli florets between the two halves. Set aside. 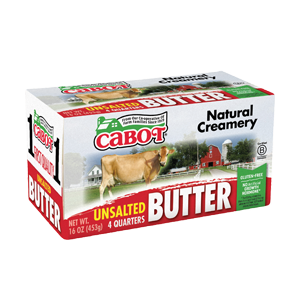 Melt Cabot Unsalted Butter in a small saucepan on medium high heat. Whisk in milk, stirring to combine. Lower heat to medium low and add shredded Cabot Sharp Cheddar Cheese, parsley, basil and oregano. Continue to whisk until the cheese is melted and the sauce is smooth. Pour the sauce evenly over each spaghetti squash half. Place squash in oven for an additional 5-7 minutes, or until the cheese is melted and slightly browned. Remove and serve. Looking for another crowd-pleasing spaghetti squash dish? Try this yummy Spaghetti Squash Au Gratin. 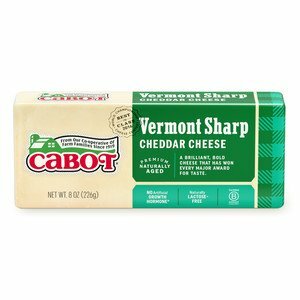 Cabot is owned by 800 farm families who work hard to ensure that all our products are made using only the finest ingredients. We’d love to hear your thoughts so, if you’d rate and review this spaghetti squash alfredo recipe after making it, we’d really appreciate it! CUT spaghetti squash in half. Using a spoon, scoop out the seeds. Drizzle olive oil over the spaghetti squash flesh. Rub the oil in with your hands. Place prepared spaghetti squash flesh side down on a baking sheet. Bake for 40 minutes, or until the squash is tender and flakes easily with a fork. REMOVE from oven and flip the squash over on baking sheet so flesh side is facing up and evenly distribute the cooked chicken and broccoli between the two halves. Set aside. MELT butter in a small saucepan on medium high heat. Whisk in milk, stirring to combine. Lower heat to medium low and add shredded cheese, parsley, basil and oregano. Continue to whisk until the cheese is melted and the sauce is smooth. POUR the sauce evenly over each spaghetti squash half. Place squash in oven for an additional 5-7 minutes or until the cheese is melted and slightly browned. Remove and serve. It appears that one ingredient is missing: a thickener. If flour, or something with the same characteristics, isn't added to form a paste with the butter, the sauce is going to be very thin. Thank you for your feedback. Our RD comments the addition of cheese provides enough body to the sauce that is poured over the chicken and broccoli.